Ally and Tarley. Here is a wonderful German Shepherd rescue story given to us by one of our readers, Ally, who was willing to share her story with others. It shows Ally's willingness to first take a rescue dog into her home but also the perseverance needed to help this dog overcome the challenges it was facing to become a loving pet. Special thanks to Ally for sharing her story with others. It shows that you don't just throw in the towel when problems arise with a living being but that you take responsibility and face up to the challenges and in the end you will be rewarded with a loving pet. Not all GSD rescue stories are so extreme but Ally's story does illustrate that problems can be overcome with patience and a lot of love. Enjoy. Here is my babies story, I hope we can be an inspiration to all potential GSD rescuers everywhere, although here in England they are very popular rescues. It was in the summer of 2003 that I decided that I wanted another dog, (I had owned a dog before). The kind of dog I had in mind was a Labrador or Lab/mix preferably male. I have rescued cats, so there was no question that it would be a rescue dog for me, I hate the thought that they may have been mistreated or just abandoned, all they want to do is love someone. I had visited the rescue centre (5min drive away) a few times before, and although I could have brought home every dog there, I was strong, I knew I had to find the right dog for me and the family and make sure we were right for the dog. It had been a few weeks since my last visit, so on this occasion there was a lot of new dogs at the centre, and to my surprise most of them were GSD's. I didn't really notice Tarley at first. Bit of sad story, her previous owners took her to the vets to be destroyed because she had gotten too big and kept chewing the kids toys, (didn't they know that cute fluff balls grow). Fortunately the vet refused to do this, and placed her at the local animal rescue. 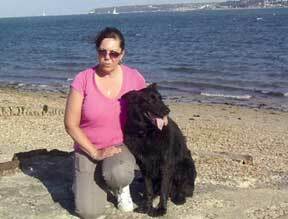 I had never seen a black shepherd before, but she made sure I took notice and it was love at first sight, the next day I had a home check, which I passed, and was told I could take her home in one week as she had just been spayed and micro-chipped. I went to visit her everyday, so by the time I could take her home we had become friends. Well, what can I say, the first day home was a real mix of emotions, she went from being a very quiet sweet dog, to a complete nightmare, (ha ha). chewing everything in site, bombing around the place like a race track, barking relentlessly, and finally, when my Husband returned home in the evening, she decided he was not coming in the house and became a little too over protective, we very quickly let her know that this was not acceptable. The next couple of days were really full on, after only a couple of days of having her, we noticed she was hopping, took her to the vets who diagnosed a torn cruciate ligament, it needed to be replaced with a prosthetic one. The insurance wouldn't cover it as we hadn't had her 2wks. She had the surgery, it cost us nearly £2000. It was a very difficult time, she had a bad infection, and had to be kept sedated to keep her calm. It took almost a year to heal. Her true behaviour had by now shown itself, she barked and growled at EVERYTHING, from the postman to the wind. Particular dislike of men, didn't walk on a lead, stole food in the house, chewed on the cats......But...... I persevered, I have a beautiful national park right on my doorstep, where I took her every single day,and still do, and gradually she stopped the barking, she was happy to let people make a fuss of her, and walking on the lead vastly improved (it took a lot of patience) she's a very big girl and weighs about 40kg,(88lbs). Now 3yrs on, she is wonderful, obedient, most of the time, walks beautifully, sleeps with the cats in her bed, (but outside they know they are fair game).I spent a lot of one2one time with her, teaching her to do basic tasks, she was really willing to please me and learn, we had so much fun, and now she is more than happy to do our little routine for a captive audience, I wouldn't be without her. She's a real softy, but still hates the postie. I would recommend a rescue dog anytime, particularly this breed, they are still much feared here in England, they carry a very big stigma. This breed of dog is often unwanted once the owners realise they cant cope and have no idea of what they had taken on. There are many GHD rescue centres here, but many more end up in dog pounds.They rehabilitate extremely well, my Tarley is so loyal to me, I have had a rescue dog before, and they have something unique about them. Remember, everyone loves a puppy, but not many love em when they become teenagers, Tarley was 10months when I rescued her and a handful, but now she is all grown up and a complete joy, ( a little like our kids, my teenager was horrid, but didn't put her in the pound). Anyone thinking about rescuing a Shepherd should it's so rewarding, and they are extra special. My best friend fell in love with Tarley, she had seen how we had grown, this inspired her to go to the centre where I adopted Tarley and get a GSD all of her very own. She adopted a lovely boy who had been beaten sadly, but him (Diesel) and Tarley love each other to pieces. One photo was taken last summer, Tarley and I had a holiday by ourselves down on the coast, we stayed with a friend of ours and her dogs, Tarley had never seen sand before, and although a very keen swimmer was unsure of the sea, this was soon overcome and we spent most of our days swimming together. 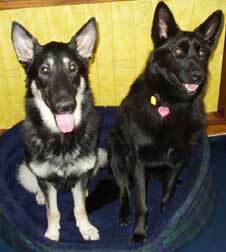 The other pictures are of Tarley and her boyfriend Diesel. I hope our story can be an inspiration to anyone thinking about adopting an unwanted GSD.